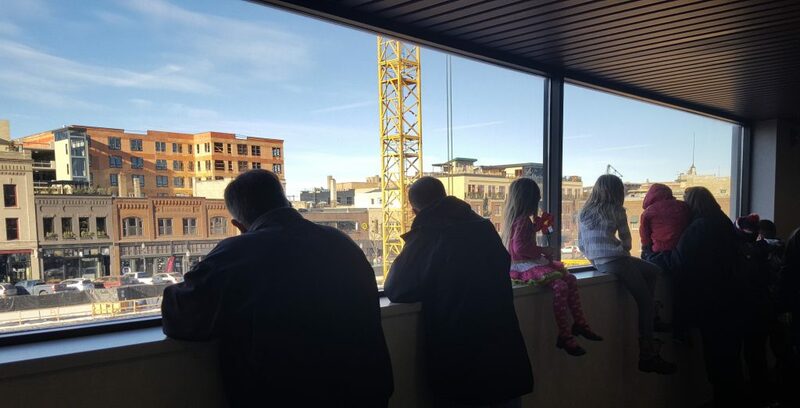 The downtown Fargo skyway system has become a great place for interested people to watch the construction of Block 9. The bird’s eye viewpoint offers close-to-the-action views from a warm perch. We are excited that the project has drawn a following! We invite you to join us Thursdays at noon in the skyway, at the window facing west on Broadway, directly across from the skyway mural. We will have project leaders on hand to share what’s happening on site and answer questions you have. We hope to see you there! Block 9 is rising out of the ground. The tower is expected to have it structure at full height (235 feet) by late fall of 2019, and the ramp precast structure will be fully assembled by late spring and ready to park cars in late summer.